The Beauty Berry Bush, as the name implies, grows beautiful tightly clustered berries on its thick branches with green leaves. 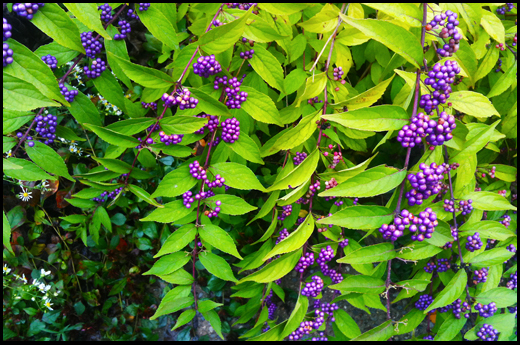 The name Callicarpa combines calls, "beauty," and Carlos, "fruit." Plant in spring or fall where springtime brings pretty but small pinkish-white flowers. Then comes fall with colorful berries of bright purple or sometimes white, and yellowish-green foliage. Three to eight feet tall and wide, the deciduous shrub proliferates. If conditions are favorable, it may grow to ten feet. This purple plant isn't picky on where it dwells as it thrives in full sun or partial shade and well-drained soil. The berries are so vivid they look painted and are a spectacular addition to yards or any garden. The plant also looks magnificent as an arrangement for a tablescape or centerpiece indoors, especially to bring a unique warmth for the holidays. It may also be planted in a container if preferred. Transplanting should be simple enough. Kids may enjoy being playful and artistic with the small and bright berries. Beauty Berry Bush is not widely known by most gardeners, wildlife such as various bird species eat the grains and seeds and disperse them, while butterflies and bees enjoy the flowers. For more than a century, the plant has been used as an insect repellent for a variety of biting insects as a traditional folk remedy. The roots and berries were used by Native American tribes to treat rheumatism, dizziness, stomachache, and colic. White-tailed deer strongly favor the foliage as a treat. Squirrels eat the clusters as well. If not eaten by wildlife, the berries will persist even after the leaves drop off. Great for winter growth, the seeds stand out marvelously against the snowy white landscape. The well-established shrub should endure droughts and is heat tolerant. Pruning is not usually a problem as the branches droop leisurely, effortlessly and openly, although may be necessary during dormancy in early spring or late winter. Fewer berries will grow if excessively fertilized. An increase in fertilizer will bring more leaves though. Whether it is produced in a native landscape or if many are planted along a border, the Beauty Berry Bush is striking in appearance. Space 4 to 6 feet apart for best results. A more comfortable to grow plant may not be found. It isn't highly prone to disease either.